Wow. Orzhov Tokens is legitimately a thing. Between the Afterlife triggers and the Lifelink ability with her decent toughness, I think the knew Teysa is fantastic. We'll just have to see how many more Afterlife creatures are created and how many more dying triggers there are. Off the top of my head, Doomed Dissenter, Deathbloom Thallid, Martyr of Dusk and the newly spoiled Seraph of the Scales all look really good with Teysa. Good stuff. Considering the power of Judith, Mardu might be another direction to explore (yes, even with the "nontoken" clause on the second ability). A glorious new age for aristocrats begins... especially in EDH. Not quite. Unless you can get extra Phoenix into your graveyard. 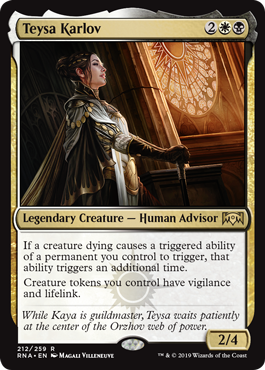 So, adds vigilance and lifelink (thus making me think back to earlier Orzhov lifegain decks) to my tokens, and doubles death triggers. So now my Grave Pact and friends are card advantage. My Fecundity is actually a Gift of Estates for everyone.. My Skullclamp turns tokens into cheap Opportunity. Blade of the Bloodchief and friends get big fast. And Blood Artist and Zulaport Cutthroat kill you twice as fast. And don't forget, it also applies to other things, as long as the permanent going to the graveyard is in fact a creature. So if you have a Femeref Enchantress and someone kills your, I don't know, Archetype of Finality, you get a Divination. If you have a Disciple of the Vault and your Wurmcoil Engine dies, Disciple triggers twice and (per Wurmcoil) you get two of each token. If you have something like Dryad Arbor and Titania, Protector of Argoth and the former dies, you get two 5/3s. Just remember, one of the persist/undying triggers fizzles.